Wynwood is noted to be the 10th best art collection in the World! With over 400 Murals, Wynwood has become the largest street museum in the World! 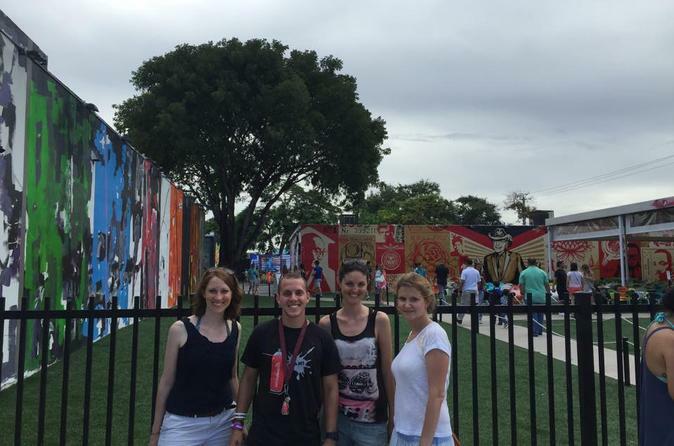 With our experienced and educated Tourators (tour guides and art curators with Bachelor of Fine Arts or Master of Fine Arts degree) are ready to guide you through the Urban Art Scene of Wynwood. Enjoy the explosion of color and the stories and trivia of the history of Wynwood and its artists! Meet your guide at the Wynwood Walls to begin your small-group walking tour, limited to eight people. With your guide, who has either a Bachelor or Master of Fine Arts degree, visit the Wynwood Doors and Wynwood Walls Garden, a development of artist Tony Goldman. See large warehouses covered in art from the likes of Ron English, Shepard Fairey, Swoon, Logan Hicks, and London Police, and stroll off the beaten path with your guide to continue your exploration with mural art and graffiti that isn't typically found by visitors. Visit two signature galleries — a recycled art gallery and a master gallery. At the end of your tour, you will walk away with a great artistic experience and an education in street art fun.